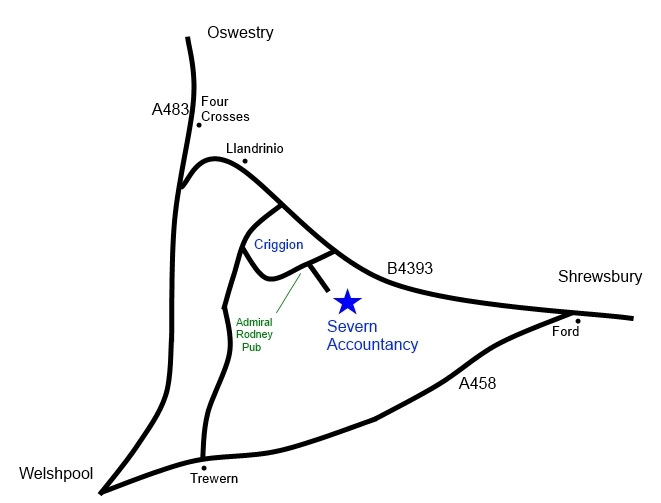 On the A483 from Welshpool or Oswestry, take the turning for Llandrinio. Drive through Llandrinio and over the humpback bridge, down the straight (ignoring the first turn signposted for Criggion which goes to the quarry) round a few bends and take the right hand turn signposted for Criggion just before the 30 mph limit. After about half a mile you will see the Admiral Rodney public house on your left. Just before their car park is our lane. From Shrewsbury, take the A458 and turn right at Ford just after the Smoke Stop. Continue for 6 miles through Alberbury, Coedway and Crew Green and take the left hand turn for Criggion. After about half a mile you will see the Admiral Rodney public house on your left. Just before their car park is our lane.